I was originally going to post this to the author blog, but TFT has been neglected for a long time and I felt it was appropriate to post it there first. Today, the Colts and Peyton Manning announced that they planned to part ways, a reality that seems absolutely inconceivable. Peyton Manning is the Indianapolis Colts. People can deny it until they're blue in the face, but I don't think we'd have a new stadium and convention center without Manning. 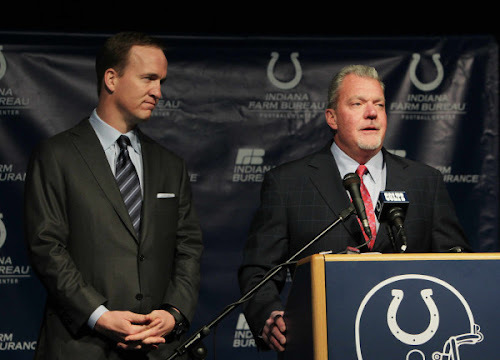 It's entirely possible the Colts would've crumbled so epically that they were forced to leave the city. Perhaps not, but I believe that's the case. Manning has meant so much to the fans in Indianapolis, and this is a day to remember how truly great he's been for the community. For more than a decade, Manning has defined excellence. With #18 under center, no lead seemed insurmountable (even in Foxborough). The circumstances surrounding Manning's release are a jumble of the impossible. A roster with too many holes, the next "anointed" quarterback coming in the draft, salary cap issues, age, and injury. As many have pointed out, if the Colts win one more game, Manning may have finished his career with the Horseshoes. The Colts have said goodbye to Peyton Manning. Inevitably, we'll turn next to speculation about where he'll go next and what his "legacy" will be. Today, fans should pause to remember the good times and say goodbye. Tampa Bay: The Comeback - With the Colts trailing 35-14 in the fourth quarter, Manning and the Colts engineered a mind-boggling comeback and took the game to overtime. The comeback included a recovered onside kick, an onside kick that wasn't recovered, a personal foul penalty, a blocked field goal, and a missed field goal nullified by a penalty and followed up by a made field goal that went off the upright. The Turnaround - In his rookie season, Manning struggled, finishing with more interceptions (28) than touchdowns (26) while leading the team to a 3-13 record. The next season, it all came together for the Colts. With rookie running back Edgerrin James added to the mix, Manning and the Colts went 13-3 and secured the first-ever home playoff game for the Colts in Indianapolis. Motor City Demolition - On a brisk Thanksgiving Day in 2004, Manning threw six touchdown passes against an admittedly lackluster Detroit Lions team. It was symbolic for the holiday: Detroit was the turkey...Manning carved 'em up. He threw for 236 yards and six TD's...and it didn't even take him three quarters to do it. We saw Jim Sorgi that day. The Fake Spike - During a 2001 game against the New Orleans Saints, Manning faked a spike to kill the clock...and then proceeded to run all the way to the end zone for a touchdown. The fake was so effective, however, that the officials blew the play dead. The TD was called back due to an "inadvertent whistle," although Jim Mora was trying to hustle his team into the locker room with the points still on the board. Take the Ball Away...and He Still Wins - During a Monday Night Football game against the Miami Dolphins, the Colts' offense only had the ball for 14 minutes and 53 seconds. The Dolphins dominated time of possession, holding it for 45 minutes and 7 seconds. The problem for Miami? Every time the Colts touched the ball, they scored. Colts won this one 27-23. Somehow, Manning threw for more than 300 yards on 14 completions. He's Throwing the Ball to Jerry Rice, Folks - During a glorious Pro Bowl afternoon, a reporter asked Peyton Manning about comments made by kicker Mike Vanderjagt, who criticized Manning and Tony Dungy on Canadian TV. Manning's response was pure awesome: "Here we are, I'm out at my third Pro Bowl, I'm about to go in and throw a touchdown to Jerry Rice, we're honoring the Hall of Fame, and we're talking about our idiot kicker who got liquored up and ran his mouth off. The sad thing is, he's a good kicker, he's a good kicker. But he's an idiot." I Think We've Got Something Here - They say the preseason doesn't mean anything, but when the first pick in the draft hits Marvin Harrison for a touchdown on his very first throw in a preseason game, you hope it's a good sign. Manning and Harrison had an uncanny mental connection honed by hours and hours of practice, and it showed. I can still see Manning zipping the ball to Harrison on a slant as #88 did the rest. Hunter Smith Took a Break that Day - In a wild divisional playoff game at Kansas City, the Colts outlasted the Chiefs 38-31. Neither team punted that day at Arrowhead Stadium, and Manning was absolutely unstoppable. He was 22/30 for 302 yards and three touchdowns. This game served as a microcosm of the Manning Era; while the Colts couldn't stop scoring...their defense couldn't stop the other team from scoring either. How Did He Do That? Really? - The Colts faced a tough road game at Baltimore in the 2006/2007 playoffs. The Ravens, as usual, brought an intimidating defense, holding the Colts to field goals (Adam Vinatieri kicked five of them). The biggest play of the game, however, came from Manning. On third-and-five, he hit Dallas Clark for a first down that kept the clocking churning. The window for that ball was impossibly small, yet somehow Manning managed to complete it. The 14-yard gain chewed up more clock and set the table for Vinatieri's fifth field goal and (more importantly!) a nine-point lead. The Real Super Bowl - With the Colts trailing 21-3 at home against the New England Patriots, all Colts fans could think was, "They're (the Pats) doing it again! We hate these guys!" The Colts drove for a field goal just before halftime. In the second half, Peyton Manning came to play, leading the Colts to a comeback victory and punching the team's ticket to Super Bowl XLI. I sprained my ankle jumping up and down during this 38-34 win and called everyone willing to pick up their phone. We almost saw Jim Sorgi that day after Peyton banged his throwing hand against an opposing player's helmet. Seeing him mouth, "Get ready! Be ready!" to Sorgi remains a chilling scene. 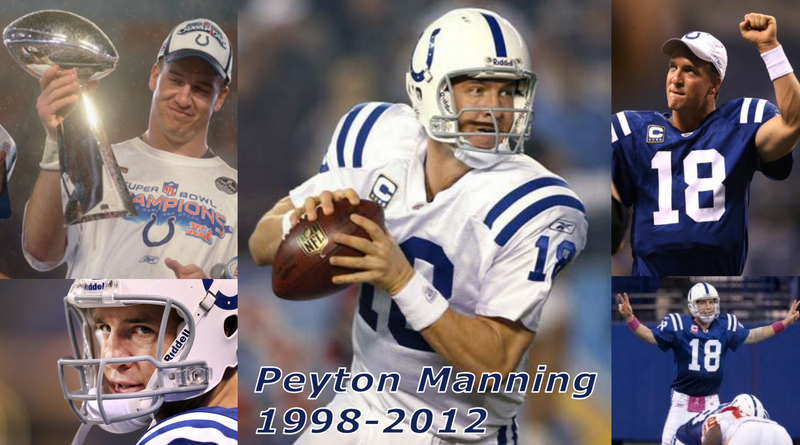 Thanks, Peyton. We'll miss ya.